Start by finding inspiration so you know what sort of look you want to create in your home. You can use sites like Pinterest and Instagram, as people put up gorgeous gallery wall pictures all the time there! Doing this will give you an idea of the sort of pictures and shapes you’d like to include, so save them to look back on later on. You may also notice that alongside a gallery wall, people may put up shelves with a few ornaments on them, or have a large, leafy green plant close by. This adds further visual interest and can look fantastic! There are usually two types of gallery wall: more uniformed gallery walls with similar pictures of similar shapes, and eclectic walls that use various pictures and picture framing styles. If you like to incorporate colour, pattern, and interest into your home, an eclectic wall will likely suit you better. Plus, you’ll end up with a unique gallery wall that you can guarantee nobody else has! Before you start buying your pictures and frames, use cardboard to cut out similar shapes and decide what you think looks the best on your particular wall. You can also use newspaper and a bit of sticky tape to give yourself an idea. Why not test out various arrangements and take pictures so you can compare and decide what looks best later on? Buying your images from a variety of places will leave you with a gallery wall that has real character. You don’t want to fall out of love with your gallery wall after a while, so make sure you avoid trends. Go with the styles that you like, not the styles you think are ‘in’ right now. The worst thing you can do is start banging holes in your wall by just eyeballing the pictures and the space and hoping for the best. Don’t chance it! Instead, use your cardboard or newspaper and then stick the pictures over the top when you have the right placement. You can also lay out the images on the floor beforehand to see what works best. Then, you can take your time actually hanging them up on the wall! For your gallery wall to look the absolute best that it possibly can, choosing the right wall to hang your pictures is key. It should be a wall without windows or any other distractions, and will ideally be a neutral colour so that the pictures pop. Gallery walls usually look amazing in white. You can definitely get away with other colours though, depending on your decor style. Just bear this in mind when you’re deciding on the right wall to go for. If you do decide to go for the eclectic look but you’re worried that it will look like a “mish mash” that was thrown together with little care one style tip is to make sure every frame has a twin. Providing you choose two frames of each, your eclectic wall will still look cohesive and work very well. 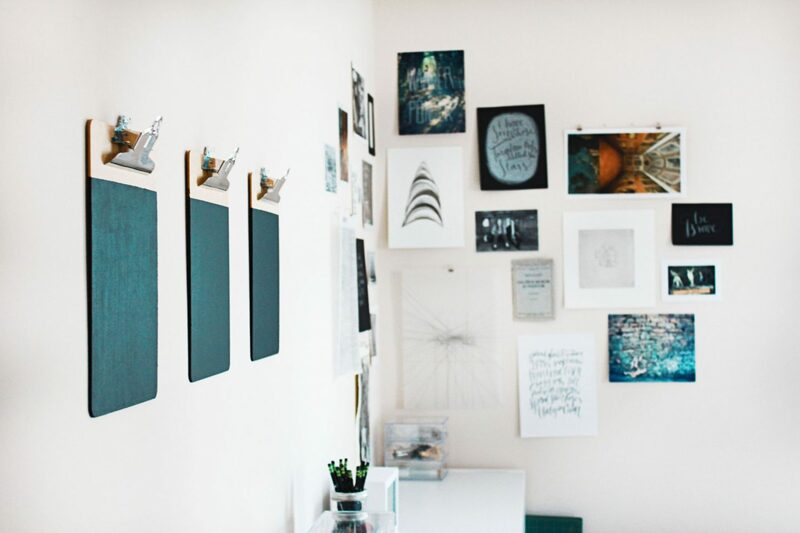 Sometimes, less is more when it comes to a gallery wall. You don’t have to fill up every inch of space with a picture. Even just having 4, 5, or 6 pictures can work really nicely. Some people do choose to use more than this depending on the look they are going for, and of course this is fine. It’s what you like the look of most; it’s just worth bearing in mind. Maybe choose 4 pictures you really like to begin with, and then add more if you decide you need more later on down the line. Plus, it gives you more time to save up for more high quality pieces. The space between each piece should be roughly the same as you are hanging them. Eyeballing the space so that it’s pretty similar is fine, as long as you’re confident doing it and cool with a more organic appearance. If you’re not, you should definitely get your tape measure out and use a spirit level to ensure each piece is perfectly placed. Again, it all depends on the look you’re going for and what you think is going to work best. Every gallery wall should have a ‘hero’ piece. This is your favourite piece, usually the largest piece, and you should attempt to choose the other pieces on your wall with the hero piece in mind. This is the piece that you should take the most time searching for. When you fall in love with a piece, you’ll know it’s your hero piece! Bear in mind that it’s always worth spending a little more to get a high quality, unique hero piece than simply finding something on your local high street. Having a piece commissioned by an artist you like probably won’t be as expensive as you think, and is a totally worthwhile purchase if you know you’re going to love the piece forever! You can usually find artists willing to commission pieces in your area by using Facebook, or you can ask your friends on social media. So, how do you make sure that your other pieces fit in with your hero piece if they don’t have to be the same size, style, or shape? Colour! Having one colour that links the pieces together is a good way to make sure everything looks fantastic on the wall. You don’t have to have the exact same colours in every single piece, as long as one colour in one piece can be linked with one colour in your hero piece. Colour can easily bring things together no matter the style. Investing in good hanging fixtures will save you having to make expensive repairs later on. You don’t want your beloved images falling off your wall and cracking in the middle of the night, especially if you’ve had them commissioned or spent a lot of money on the frames! Take your hanging fixtures into account when working out your budget and make sure you find reliable ones. 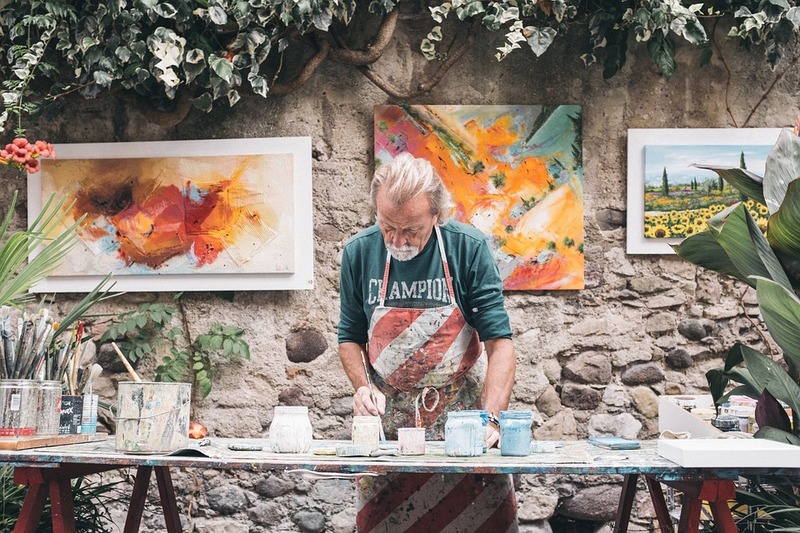 If you’re unsure if you’ll be able to hang the pictures sturdily enough yourself, it might be a good idea to have somebody who is a dab hand with tools come over and do it for your peace of mind. There you have it: 12 tips that will help you to create the most perfect gallery wall. Using these 12 tips when you get started will help you to create a wall that is unique, beautiful, and matches the personality of your home perfectly. It’s the perfect way to add visual interest, and it’ll definitely get people talking next time you have them over! Do you have any tips of your own that you’ve used in the past for creating walls like this, or even hanging pictures? Leave a comment below!